Established building standards for home insulation are far below the standards recommended by the US Department of Energy. An average home in Atlanta, especially if it is over 10 years old, may have insulation with a value as low as R-19! We have the ability to quickly add cellulose insulation to an attic which will provide a substantial reduction in home energy costs. Adding only 8 inches of cellulose insulation can increase the average attic insulation to a value of R-49! Our insulation upgrades will immediately begin to reduce your utility bills. #1 Energy Problem: Insufficient Insulation! The average home has less than 12″ of Fiberglass insulation! If an average heating and cooling costs $300 per month, with an average savings of 30%, you could save $1,080 per year! $1,080 = $5,400 savings over 5 years . . . $10,800 over 10 years! Cellulose insulation beats fiberglass insulation in performance R-value (an expression of heat transfer resistance). At a value of R3.6 to R3.8 per inch, cellulose insulation is considerably better than most mineral fiber blowing wools. But, R-value is only one factor in the energy efficiency of a home. Studies of actual buildings regularly show that cellulose-insulated buildings may use 20% to 40% less energy than buildings with fiberglass, even if the R-value of the insulation in the walls and ceilings is identical. We also offer Johns Manville poly-encapsulated insulation. This material is a formaldehyde-free fiberglass insulation with R-values up to R-38! Another advantage is that the poly-encapsulation prevents the moisture penetration that causes insulation to fall away from sub-floors. If a fire occurs, the dense structure of cellulose and its fire retardants slow the spread of fire. Scientists at the National Research Council Canada report that “cellulose in the wall cavity provide an increase in the fire resistance performance of 22% to 55%.” Fire is not impeded by fiberglass insulation. 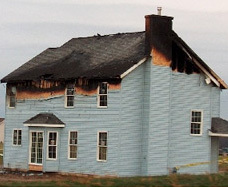 The photo to the left shows a home insulated with cellulose insulation, which was devastated by fire. As you can see, the cellulose insulation actually contained the fire to the attic space, sparing the majority of the house from damage (photo courtesy of Advanced Fiber Technology). Read more about our Atlanta home services.